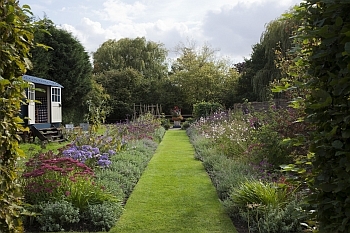 Several gardens in Burnham on Crouch are open to the public at regular intervals as part of the National Gardens Scheme(NGS). 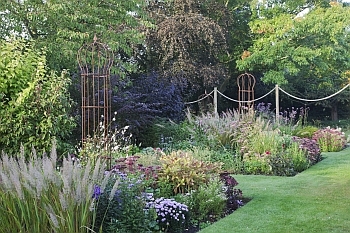 Hedges, divide and add structure to this 1.5 acre country garden. Spring brings blossom into the orchard, wild flowers and drifts of bulbs, later there's summer abundance in the kitchen garden and wide densely planted borders. September's stronger colours and nectar rich varieties encourage foraging bees and clouds of butterflies. This garden is a personal favourite! A Mediterranean/Moroccan oasis with a small back garden with vine covered pergola, tranquil water features, mosaics, sculptures, dense planting including some unusual varieties. Various seating areas including a Moroccan style tent. The houseboat overlooks the River Crouch is bedecked with a plethora of vegetation, both decorative and edible. To the west you will find packed to the gunnels an assortment of flowers and shrubs mingling with the ropes and chains. To the east, hard landscaping is softened by a large vegetable trough. There is a sitting area overlooking the water surrounded by more flowers and shrubs.